The Preclinical Safety Leadership Group (DruSafe) is composed of senior preclinical safety assessment leaders from IQ Consortium member companies. The mission of DruSafe is to advance the science of nonclinical safety assessment and affect the global regulatory environment through our collective experience and resources in order to accelerate delivery of safe and effective medicines. 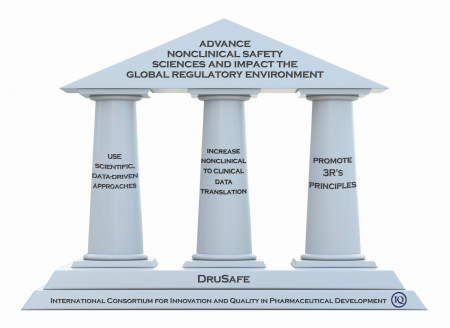 The goals of DruSafe are designed to complement the 2011 FDA Strategic Plan to advance regulatory science and modernize toxicology. The activities are selected to enhance product safety by advancing new and better preclinical testing strategies, tools, endpoints, and models for assessing and predicting human safety. To achieve its goals, DruSafe formed and oversees a few working groups and collaborates with other groups. Correlation of in vivo nonclinical safety information with clinical findings; cross industry data of identified nonclinical safety signals will be collected in a database and evaluated to determine the categories and characteristics associated with predictivity of translation to humans. Correlation of the results of in vitro models of reproductive and developmental toxicity with those of in vivo studies; cross industry data of models of developmental toxicity will be collected and analyzed to determine the robustness of in vitro models to identify important safety endpoints. Evaluation of models assessing suicidality risk; scientific experts in safety pharmacology will work together to clarify the underlying risk factors associated with suicidality and evaluate the current science and value of known nonclinical tests for predicting and interpreting clinical suicidality. DruSafe also actively collaborates with other groups within and outside of IQ. With the IQ Drug Metabolism Leadership Group, DruSafe explores improved approaches to integrating drug exposure data. With the 3R’s Leadership Group, DruSafe collaborates in reducing, replacing or refining the in vivo nonclinical safety testing required in drug development. DruSafe holds annual meetings and workshops with the FDA (in conjunction with BioSafe) to promote alignment and advance science and best practices in key areas related to preclinical safety. DruSafe will additionally collaborate with IQ Clinical Pharmacology Leadership Group and FDA to deliver a seminar on safe clinical starting dose and escalation, within the context of Oncology studies. DruSafe collects and generates data to support best practices and updates to nonclinical regulatory practice and guidance.